Quite the duplicitous plot! 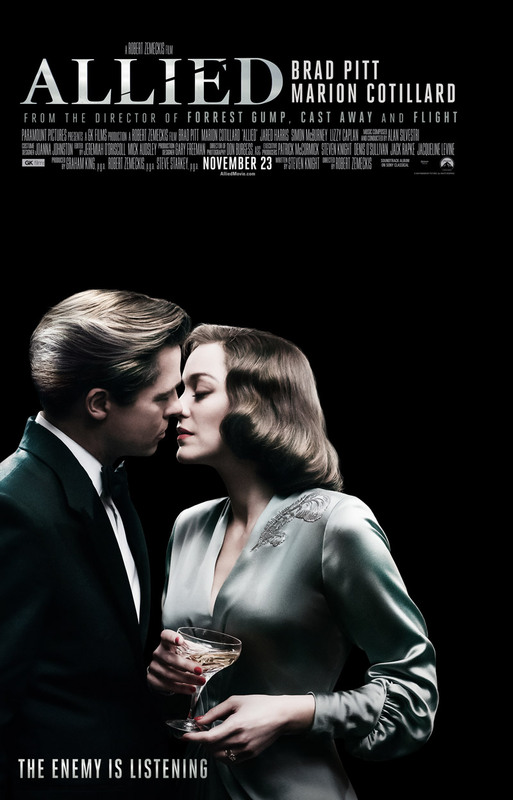 Robert Zemeckis’ Allied released by Paramount Pictures is a thrilling tale of espionage and love. We have certainly seen a few different “spy” movies over the last couple of years; some more about espionage and others more about the drama that ensues afterwards. Fortunately, Allied feels like a genuine spy movie that actually contains espionage. The production design and costumes are a beautiful throwback to the fabulous 40s. You’ll find yourself reaching for a glass of champagne and swing dancing to Benny Goodman’s timeless big band jazz hit Sing, Sing, Sing. There is one city synonymous with WWII, espionage, and romance and you will appropriately return to that iconic city of Casablanca in Allied. This is definitely not a reimagined Casablanca but there are indirect references to that movie sprinkled throughout this new story. Films like this one require top notch talent, and both Brad Pitt and Marion Cotillard deliver outstanding performances to accompany this staple in film genres. Not limited to the love story between Pitt’s and Cotillard’s respective characters, the movie also includes some deadly shootout scenes and dangerously close encounters with the Nazis behind enemy lines. Commander and intelligence officer Max Vatan (Pitt) is stationed in the famous city of Casablanca in French Morocco where he teams up with French resistance movement leader Marianne Beausejour (Cotillard). Impressed by her ability to so effectively blend in and create her authentic cover, Vatan soon finds himself falling in love with his partner. Following the assassination of a Nazi ambassador, Beausejour and Vatan flee to London to start their life together. Everything is going beautifully for the happy couple in their second year of marriage with a child when Vatan’s superiors confront him with the suspicion that Marianne is in fact a Nazi spy. Refusing to believe it to be true, Max must now conduct his own investigation into his wife’s history to protect the ones he loves so dearly. I absolutely adored the look and feel of the film as it echoes the era of the Golden Age of Hollywood. Although this movie plays off a tad listless as a result of failing to elicit a strong emotional response from the audience, it is not without it outstanding elements. It benefits from solid acting and beautiful cinematography as well as some fantastic symbolism. Robert Zemeckis’ talent for visual storytelling is clearly visible in this period film. The weakness in the ability to successfully leave a lasting emotional impact on the audience is in the writing and executive producership of Steven Knight (Eastern Promises). For films that are not as much about the spectacle as they are the drama between characters and the challenges faced therein, it is vitally important that the personal/interpersonal relationships transcend the screen and directly impact the audience. All the makings were there for a deeply moving cinematic story, but it just doesn’t quite make that transition from the mostly superficial and distant. Mirror, mirror, on the wall…(interesting fun fact: this misquoted line from Snow White is actually “magic mirror on the wall”). But, I digress. The strategic use of mirrors is an incredible use of visual storytelling and symbolism. For those who have studied film or literary rhetoric, the mirror is a classic means of conveying duplicity (two sides, faces, etc of a character). Even without knowing that this was a spy movie, I would have been able to infer that from how the mirrors are shot and placed within the composition of the 24 frames a second. When using powerful symbolism as part of the visual story, it conveys so much more meaning in a scene than words could actually describe. Mirrors have long sense been a powerful metaphor even before moving pictures. But motion pictures allow for a greater use of the importance it plays in a cinematic story. Not limited to duplicity, mirrors can also be used as a metaphor for self-reflection. Whether talking duplicity or reflection, the mirror aids in conveying so much to the audience in this movie. Ordinarily, I am not a fan of classic films getting remakes; however, there are always exceptions when the core or essence of the film is held in tact but the production design, direction, and cinematography are brought up to speed with contemporary cinema. If you’re a fan of WWII era films or the timelsss spy movie, then you will definitely enjoy Allied. After witnessing the significance of Casablanca in this movie, I am actually looking forward to a remake if there ever is one. Provided. That the overall look and feel of the movie is in line with classical motion picture storytelling. I could definitely see Robert Zemeckis directing a remake of Casablanca. Occasionally there are directors who can strike the balance between a classic tale told through contemporary technology, and Zemeckis definitely struck that balance in Allied. Don’t allow the weak writing to dissuade you from watching it; there is actually a lot to enjoy in this film. After the slow burn during the first act, acts II and III are full of intrigue and suspense.